The story of Lt.William Bligh and H.M. Armed Vessel Bounty is well known to the followers of this web site, but perhaps the story of HMS Providence and Bligh’s second breadfruit voyage is not as well known. 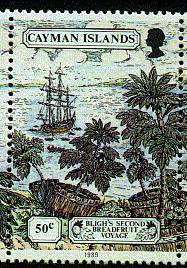 Bligh came back to England on 14 March 1790 after the mutiny and his crossing of part of the South Pacific from Tofoa to Timor Kupang in an open boat. After his court-martial, 22 Oct 1790, which exonerated him for the loss of ship, he became a commander and was again sent to Tahiti to collect breadfruit tree seedlings. On 03 August 1791 Providence and a small vessel, the ASSISTANT, sailed from England. They arrived 09 April 1792 in the roads of Tahiti, where 1281 breadfruit plants were loaded. In July the vessels sailed for the West Indies, where they arrived in January 1793. The breadfruit plants were delivered at St.Helena and St. Vincent. The ships arrived back in England on 09 Sept 1793. An interesting detail is that Matthew Flinders served as a midshipman on board the Providence.